In the delightful and frothy Cafe Society, Jesse Eisenberg moves to golden age 1930's Hollywood from New York City figuring if he can make it there, he can make it anywhere, before realizing it's the opposite, according to the song lyrics. Narrated with bemused tones by writer-director Woody Allen, who cast Eisenberg as the latest in a long line of young actors to play a surrogate of himself, Cafe Society sees Eisenberg come under the tutelage of his uncle Steve Carell, the most powerful and revered agent in Hollywood. Avoiding him at first, Carell gradually shows Eisenberg the ropes, introducing him to glamorous movie stars and Tinseltown's movers and shakers. Eisenberg finds himself most impressed with Carell's secretary Kristen Stewart. In no time at all, Eisenberg falls for Stewart, and woos her with his peculiar neurotically manic ways, which she finds charming. Alas, she has a boyfriend and a secret. Before long, the twisty plot reveals, to no real shock, her secret boyfriend is Carell himself. The real surprise is how calmly both Eisenberg and Carell take this revelation, with no animosity between them. They simply ask Stewart to choose between them. Does she marry her wealthy, powerful, infatuated older beau or the young nebbish who clearly adores her? Stewart chooses with practicality. Dejected, Eisenberg returns to New York and to the Jewish family he left behind. He goes to work for his older brother Corey Stoll, a notorious gangster, who owns a famous nightclub, and becomes a respected member of New York's elite cafe society. Eisenberg even marries Blake Lively, a model who, in a wild coincidence, is named "Veronica," just like Stewart's character. Everything is grand until of all the gin joints in all the city, Carell and Stewart, now happily married, walk into Eisenberg's. Eisenberg and Stewart have worked together as romantic leads before; their characters in Cafe Society could be the grand parents of the characters they play in Adventureland. Despite the zany twists in the plot, Cafe Society hums along with remarkably low stakes, even when Stoll is arrested and sent to death row for racketeering and murder one. Most amusingly is how Allen seemed to forego writing an ending; Cafe Society just abruptly stops on New Year's Eve, as if Allen simply decided to put down his pencil, counted his pages, decided he'd written enough and this was as good a time to call it quits as any. Absent his young muse Scarlett Johansson, Allen fumbles along with Stewart as the female lead and seems to have little interest in Lively's token character. 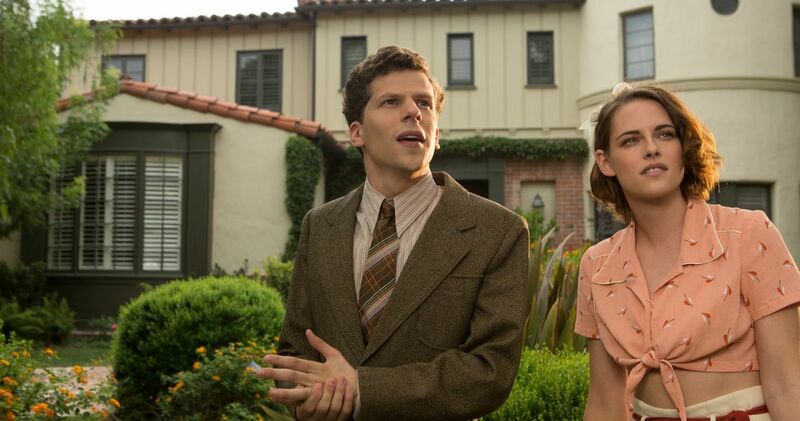 Still, Cafe Society provides witty characters and a delightful diversion, as well as a winning lead performance by Eisenberg -- the best Woody Allen impression crossed with Lex Luthor you'll find in Hollywood.